To access and print these Free Printable Multiplication Tables (also known as Times Tables), simply click the worksheet images below, and select a SAVE option from your drop down menu. Doing this will save the image to your picture file, where you can reduce or enlarge it as needed, adjust the margins, add color, or make any other changes for optimal printed results. 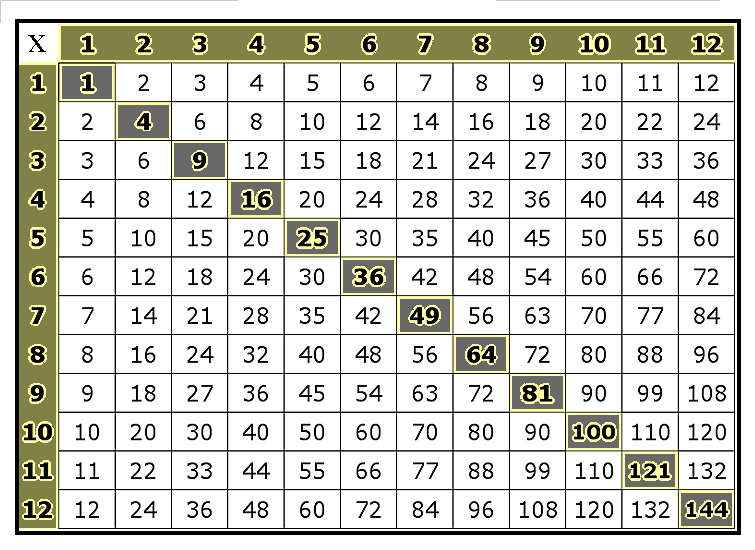 The Printable Multiplication Tables on the grid shown below represent multiplied whole numbers from one thru twelve. The shaded areas around the edge of the grid are the numbers being multiplied. The area where two shaded numbers meet is the product (the result of multiplying) of those two numbers. The shaded areas running diagonally through the grid represent the result of numbers that are multiplied by themselves, such as 3 x 3 or 5 x 5. This is commonly known as "squaring" a number. For instance, "three times three" is also known as "three squared." Multiplying a number by itself three times (as in 5 x 5 x 5), is called cubing the number. So another way of saying "five times five times five" is just to say "five cubed." Humans possess an innate tendency to perform these four functions. Methods of multiplication have been documented in ancient Egyptian, Central African, Greek, Indian and Chinese civilizations. Multiplication merely involves adding a number to itself repeatedly. So, 3 x 5 ("three times five") is another way of saying "three fives," or 5 + 5 + 5 ("five plus five plus five"). No matter how you say it, the result is still fifteen. 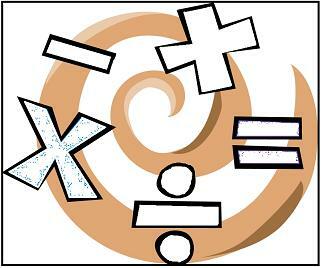 All kinds of numbers can be multiplied - whole numbers, fractions, decimals, negative numbers and even zero. Any number multiplied by zero is zero. Multiplying two negative numbers always results in a positive number. Visit this link for Free Printable Fraction Worksheets. Hit this link for a collection of free printable Scholastic Worksheets. Go to this link for a clickable, printable United States Trivia Quiz. Click here for a clickable, visual United States Map Quiz.